The Öko-Tec Tube Wall is a quick, lightweight and highly effective alternative to old fashioned dikes and sandbags. Utilising air and water, the tube wall is a series of interconnected reinforced air-filled tubes. The Tube Wall system does not rely on the weight of the wall itself for anchoring; instead it utilises the weight of the flood water for a firm seal and excellent anchoring ability. Traditional sandbag dikes take considerable time and effort to build. Often the time, labour and materials required are not available during a flood event and extensive damage to land and property is the result. An Öko-Tec Tube Wall weighs less than half a percent of a corresponding sandbag barrier and is easily handled by 2 – 4 people. Tube Wall works as well on lawns and fields as on gravel roads and asphalt and requires minimal site preparation prior to installation. 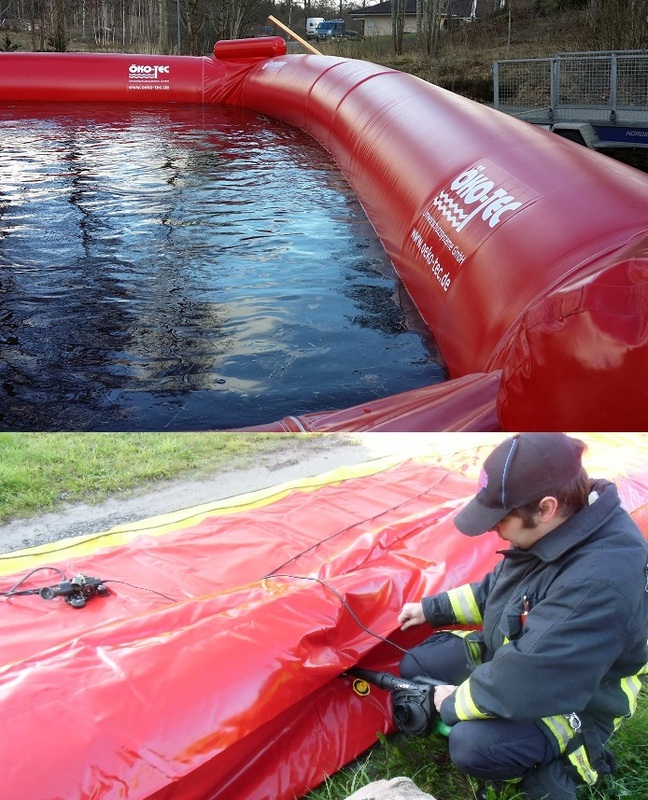 One of the many advantages of the Tube Wall Flood Defence System is its extremely quick and easy installation – 100 metres of tube wall can be installed by two men in under 1 hour. This represents a significant reduction in resource requirement and allows for rapid response, especially when time is of the essence. The Öko-Tec Tube Wall comes in 10m, 15m or 20m sections as standard, and has containment heights of between 50cm and 150com. Specific individual lengths can be provided on request.